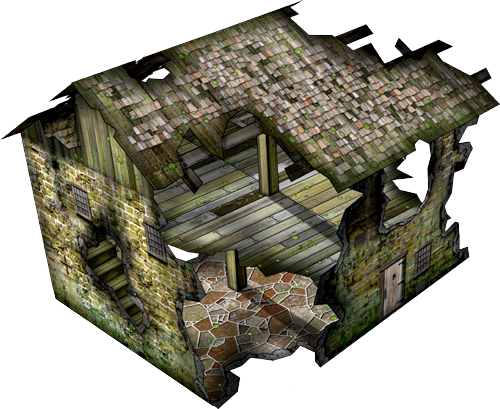 Here's my latest model, the Wrecked House. It offers walls in a choice of red bricks, brown bricks and stone. 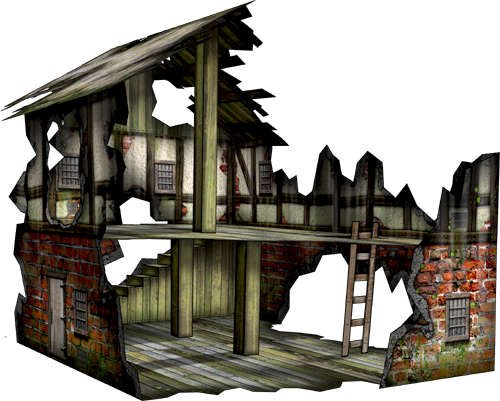 You can add a plaster-and-beam overlay to the walls, and an optional wood attic. The roofs come in a choice of thatch, slate tiles and wood shingles, and there are lots of little extra goodies. I'm really liking this series, keep it up! I love the lighting inside! Built the wrecked house this weekend and used it in a round of Mordhiem. It's pretty good. We ended up cutting the whole near the stair case larger to make maneuvering pieces on the stair case easier. I like the stair case boxes for putting 25mm bases on the staircase but wish there was a full compliment of them (seems like there are only 2 on the PDF). I plan to make a couple extra and glue them in place so we don't have to fiddle with them.